I was just thinking, but Apple could really put some new features to iOS from the Mac OS, to increase usability and functionality (plus not to mention add some new things to iOS that we haven't seen). I've been a longtime iOS user, and I admit that the OS is great, but its definitely starting to show its age. Here are some features I think Apple should (or at least consider) incorporating into iOS to make it more fresh and new. Screen Savor: I've thought this one over and that this could be useful for the iPhone. I saw a video on Jelly Bean and saw a feature called DayDream. It's pretty much a screen saver for your phone, like it could show the time, weather, stuff like that. I feel that could be really useful for iOS. So lets say your screen goes dark after a minute or two. Instead of having a useless dark screen, you could have something like a clock, or weather notice just to add to the iphones functionality. Mission Control: I feel that if Apple pulls this off right, it would make an excellent multitasking feature. I think that Mission Control for switching between apps would be a great way for multitasking, especially for productivity and last minute work. Siri: Okay, siri is descent. It's nice for things like reminders or scheduling meetings, messaging, etc. But I feel Apple could increase Siri's usability by incorporating some features of Google Now, like predictions. I think it would be nice if Siri could tell me before work that they'll be traffic on the way to work for example. I think, this way, if they make Siri less of a gimmick and more of a function, it'll become more mainstream, the way Apple intended it to be. and this last one is personal, but I'm getting a little sick of the lock screen. I hate the little dark bars where the time, date, swipe to unlock, and camera is. For the sake of aesthetics, I feel that removing these bars would give a slightly tweaked and newer look to the phone. Even from just a quick glance, I feel it would be a nice new aesthetic feel that will stop making Apple haters say "Oh, it looks exactly the same". 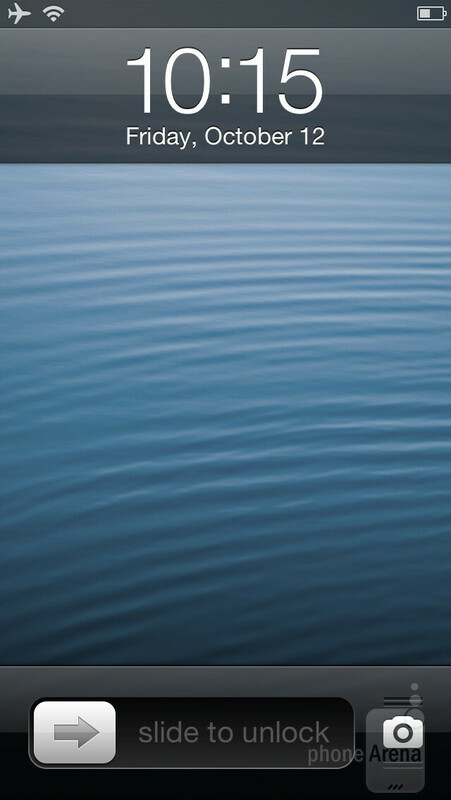 Try to imagine the lock screen without the dark bars where the time, date, slide to unlock, and camera is. I just think it'll look and feel less cramped and claustrophobic. Anyway, those are just my thoughts. What do you guys think? Only time will tell what direction if anything what Apple will bring to iOS and even enhancements to Mac OS. There is a even split with users out there in the Apple world. Some don't see a need for change. Other want change or just better design to move forward. Of course it will go forward someday, but we don't know what design direction Apple will take. Mac OS and iOS are getting better for seamless communications and function, but yes I am sure there is more to it that they can bring. We can dream up the dream, but will Apple make it reality? Last edited by John Yester; 12-04-2012 at 05:07 PM. I think that everyone is entitled to their opinion. I don’t use Dashboard or Mission Control on my Mac... I sure don’t want them on my phone. And it’s generally perceived that Apple is bringing iOS elements and look/feel to OSX, not the other way around. Don’t need a "screen savor" (or a screen saver)... I prefer my screen be dark when I am not using my phone. Active screen savers use battery power, and, frankly are unnecessary, IMO. Siri is fine for what I use it for... add more functionality? Fine. As for the dark bars across the top and bottom of the lock screen... meh. Changing them is fine. Not changing them is also fine. I do use Mission Control on my Mac but see no reason for it on iOS. Existing ways of switching apps works for me. Dashboard is a travesty that needs to be removed from OSX not added to iOS. I agree with the above that screen savers are just battery hogs. I don't even use them on my laptop. But there are apps that will show pictures or something on the screen and prevent it from sleeping which would have the same effect as a screen saver if you wanted one. Lock screen doesn't bother me. Most of the time I don't even see it because I've already swiped my phone on without looking at it.